Our eggs are some of the best you can find. 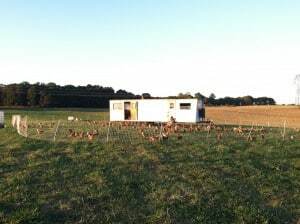 Our chickens live the life of luxury in their deluxe eggmobile, which houses their nesting boxes(where they lay their eggs), roosts for which they sleep at night, and free choice non-gmo feeders. They spend their days free-ranging on fresh pasture that they are moved to following the cows; mimicking life as it occurs in nature. This time on pasture creates the most vibrant orange yolks in our large brown eggs making them both more flavorful and healthier for you.